1. Preheat oven to 350. Prepare 3 full size hotel pans by coating with butter. 2. Cook elbows in water until almost done. remember that you're not cooking these to be a stand alone item, so, be sure to cook them well past the al dente stage. Cooking them this way well give you a nice, creamy finished product. Drain real well when done. 3. While the noodles are cooking, cook the onions and celery in a little oil, over medium heat until they're soft and translucent. Add the butter then the flour and whisk well while the flour begins to cook, don't let it brown. Start adding the milk, a little at a time whisking to break up any lumps of flour, until all of the milk has been incorporated into the mixture. 4. Leave on medium heat until the mixture is hot enough to melt the cheese. Stir in the cheese a little at a time until each batch is melted. DO NOT BOIL. Boiling at this point will cause the cheese to break down, and there's no way to fix it after this happens. Add the blacken, stir, and turn the heat off. 5. Drain the noodles and place in the prepared pan, then pour the cheese mixture over, and mix well. 6. Sprinkle the bread crumbs on top, dust with blacken, then place American cheese slices around the top leaving about a 1/2" space between the slices. 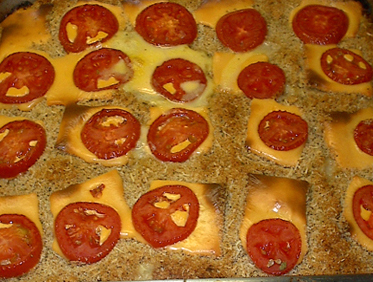 Place one tomato round on top of each piece of cheese. 7. Bake at 400 for about 30 minutes, you’ll know it's done when you see bubbles in the center of the pan. If you cook it too long it'll dry out.